Brody 13-years old, was diagnosed with alveolar rhabdomyosarcoma (ARMS) last december 2017 and is being treated at Comer Children’s Hospital in Chicago, IL. In May 2018 we met Brody during a Music Night at RMH near Comer Children’s Hospital. We shared information about Alyssa Alvin Foundation for Hope’s music and art programs and Brody was excited about submitting his gift request. His mom, Stefani, was also happy to learn about the Alyssa Foundation and enjoyed an hour of music with us. Brody lives with his mom and dad-David in Decatur, IL. Brody completed 7th grade and is ready to hang out with his friends this summer. He likes to play video games and loves sports. He has 2 dogs named Milo and Scotch. As a younger boy, Brody took piano lessons and also wanted to learn how to play the drums so his parents purchased a drum set for him. Due to Brody's medical treatment, he has not been able to play the drums, however, he plans to take lessons once he feels better. On June 4th, Brody received his Beats Solo3 wireless headphones. We hope Brody enjoys listening to his music even after he is able to create his own music on the drums. Our goal is to inspire teens and young adults to be creative and give them hope to continue living life to its fullest while facing their serious health challenges. Alyssa Starter Art Kits (SAKs) were delivered to the Ann & Robert Lurie Children’s Hospital in Chicago on Friday, June 1, 2018. A total of 50 Alyssa SAKs were received by Willow Messier, the Art Therapist at the hospital. In addition, a few ukuleles donated by Tom Stading, owner of Instrument Exchange, were received by Elizabeth Klinger, the Music Therapist at the hospital. The Alyssa Alvin Foundation for Hope was created to give hope and provide outlets for creative expression through art and music for young patients dealing with cancer and other life-threatening illnesses. We give young patients the opportunity to experience with different art mediums like watercolors or acrylics, drawing, coloring and journaling. When young patients feel tired and sad due to their ongoing medical treatments at the hospital, the music from a ukulele generates positive changes in mind, body and spirit. The change is remarkable! The young patients with the help of music create a new path towards joy, healthiness and wholeness. Blue Cross & Blue Shield of Illinois gave a generous donation check to AAFH. and Yoli - President of Alyssa Alvin Foundation for Hope accepted the check on Friday, June 1, 2018. 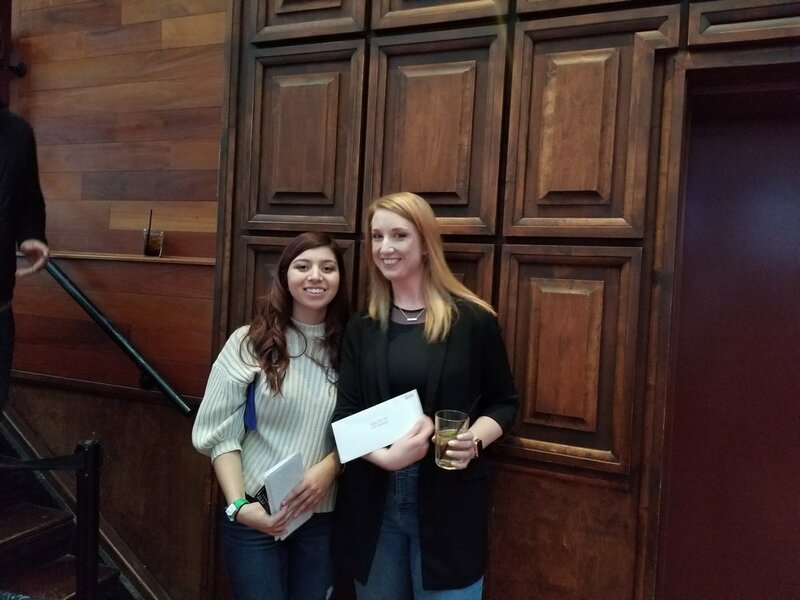 The check was presented by BCBSIL employees: Denise Perez-Cabrera who is also the AAFH Executive Secretary and Mariana Herrera-Alfaro who is an AAFH volunteer. Thank you BCBSIL employees for volunteering your time to events sponsored by Alyssa Alvin Foundation for Hope. With our sincere gratitude. You are making a difference in a young adult patients life forever. Dra. Martha Juarez from Hospital Civil Fray Antonio Alcalde de Guadalajara presented several young adult patients with their requested gifts on Monday, May 14, 2018. Also, wanted to share that Dra. Martha was involved in the first festival of Psicologia at the hospital. Dra. Martha is very active promoting both the music and art programs of Alyssa Alvin Foundation for Hope in Guadalajara's civil children hospitals. Jonathan, a 15-year-old received his new trumpet, Mariana a 19 year-old received her new violin, Sofia, a 14 year-old received her new electronic keyboard and Jorge, a 18 year-old received his new guitar. Many thanks to Dra. Martha for promoting Alyssa Alvin Foundation for Hope to the teens and young adult patients being treated for various cancers at Hospital Civil Fray Antonio Alcalde de Guadalajara-Jalisco, Mexico. It's great to continue sharing Alyssa's love of music with young patients around the world! AAFH earns Matching Dollars for each volunteer hour logged into Blue Corps by its employees and has been a community partner with Blue Cross Blue Shield of Illinois since 2016! In April, Yoli – AAFH President participated in an employee volunteering open house in the Naperville office where she met several BCBS employees-Diana Fortich, Joan Skrede and Margie Salas. Yoli shared the volunteering opportunities of our organization such as preparing Alyssa Starter Art Kits (SAKs), hosting an art night or music night at a local RMH, delivering Alyssa SAKs to local hospitals and medical institutions, and helping with our fundraising events in various roles. Employees found out that they do not need to be artists or musicians for these volunteering opportunities. We need people who want to make a positive difference in the life of a patient or their family and the time commitment is up to you….1 hour or as many as you can. Alyssa Alvin Foundation for Hope loves volunteers! Please go to our website and check-out all the things we have done for the teens and young adults around the US, Mexico and other countries. 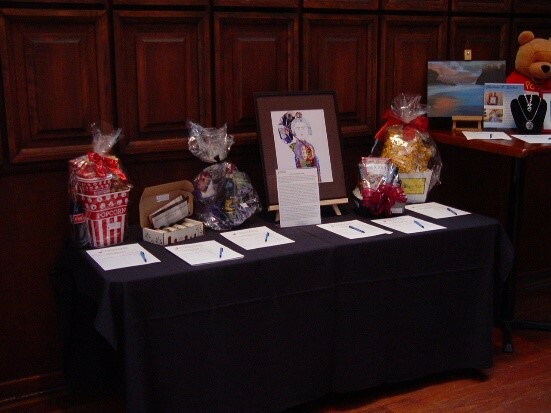 An Art and Music Night was sponsored by AAFH at the Ronald McDonald House (RMH) near Advocate Children's Hospital in Oak Lawn, IL on Wednesday, May 9, 2018. We also donated Alyssa Starter Art Kits while there with delivery made to the House Manager, Jenna Embry. The Art and Music Nights held at the RMHs are for patients and their family members of all ages so it is a treat to have multi-generations participate in our fun activities. And this is exactly what occurred that evening. Angel, 3 years old, was at the RMH with his family from Valparaiso, Indiana, while his baby sister (9 months old) Sofia, awaited heart surgery. Angel enthusiastically started in on a painting project and was quickly joined by his grandmother, Natividad, and mother, Letty. When Angel finished his art project early, he was thrilled to begin using the maracas as drumsticks on the congos we brought for the music portion of the night. His Mom and Grandma were also happy to complete their painting projects and exhibit their creative talents. 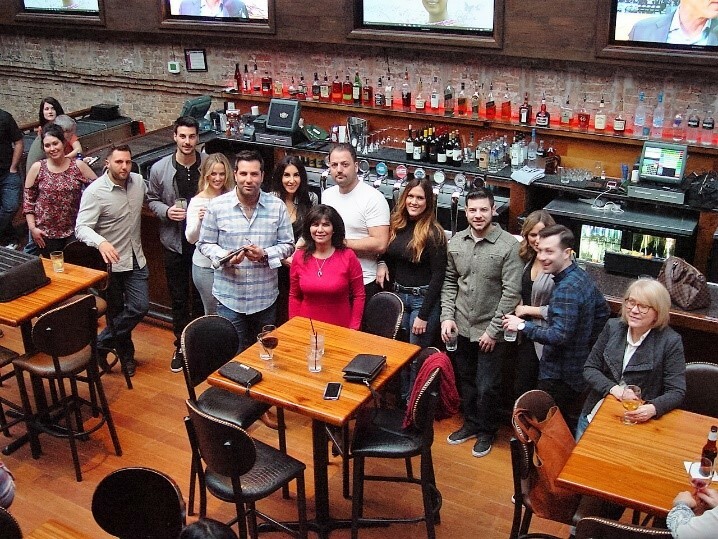 Alyssa’s memory carries on and touches people every day that we host one of our events. As supporters of AAFH, you can see the joy that is brought to these families during troubling times in their lives. We pray for everything to go well with Sofia’s heart surgery. 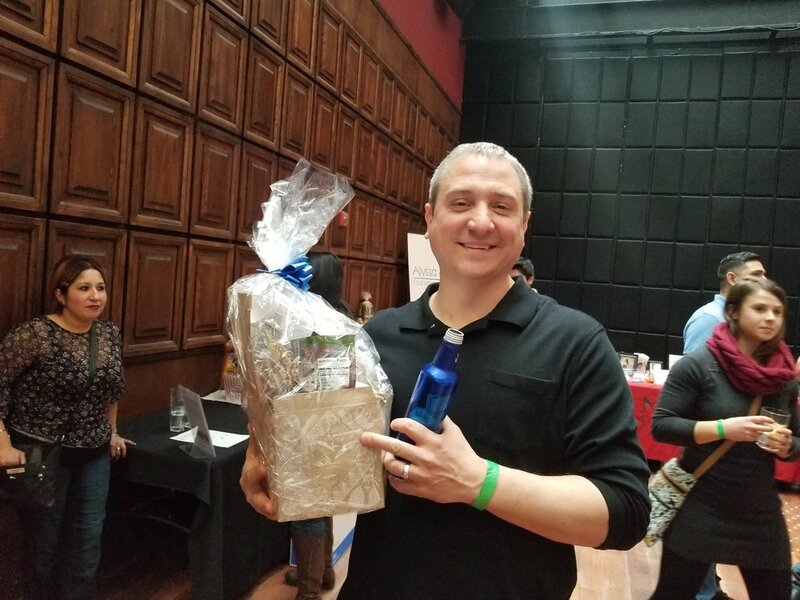 Exelon employees from Kennett Square, Pennsylvania, participated in an Alyssa Alvin Foundation for Hope (AAFH) volunteer event and prepared Alyssa Starter Art Kits (SAKs) on Thursday, May 3, 2018. A dozen employees gathered to assemble a variety of SAKs including adult coloring books, journal kits and pencil drawing kits. 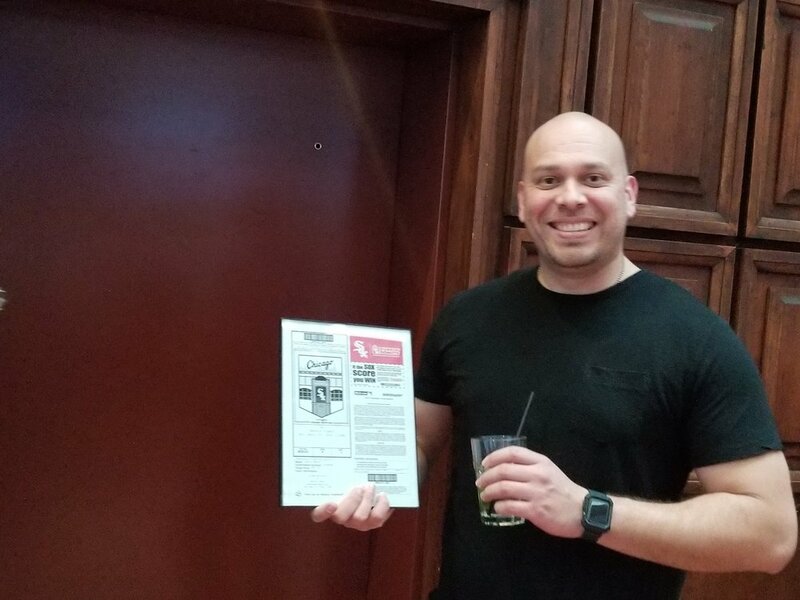 They completed the Alyssa SAKs in 16 minutes which set a new record surpassing the previous record of 26 minutes by the Exelon team at the Cantera office in Warrenville, IL! Once the Alyssa SAKs were completed, Exelon employees Joan Verra and John T. Hall accompanied Yoli, Alyssa’s mom and president of AAFH, to make the delivery to Bryn Mawr Hospital in Pennsylvania. We met with Lynn Keily – Development Office of Bryn Mawr Foundation who told us that the Alyssa SAKs will be given to young patients in the pediatric/oncology unit of the hospital. She appreciated our donation. After our Kind Heart Music Recital on April 22, 2018 at the Ronald McDonald House near Lurie Children’s Hospital, we had the pleasure of presenting Aldrick & Quinn with the gifts they had previously requested. Ashlee & Glen Schneider, AAFH Board members, presented a professional art package including an airbrush compressor kit to Aldrick. Aldrick, a 21-year-old, is being treated at Advocate Children’s Hospital in Oak Lawn, IL for sickle cell disease. Aldrick heard about AAFH from Art Therapist-Lori Mackey at Advocate Children's Hospital. Aldrick is aspiring to be a tattoo and graphic artist and hopes to pursue this as a career and work in this field. Quinn, a 12-year-old, received a Ludwig 4 piece maroon drum set from the AAFH. Quinn is being treated at Lurie Children’s Hospital for acute lymphoblastic leukemia since July 2017. Quinn found out about the AAFH from the child life staff at Lurie and expressed his desire to play drums. He also likes to play video games, basketball and baseball. These two gift recipients embody our goal to inspire teens and young adults to be creative and provide them hope to continue living their lives to the fullest. This is made possible only through the caring and support of our donors to whom we are deeply grateful. The 4th Annual Kind Heart Music Recital was held at Ronald McDonald House near Lurie Children’s Hospital in Chicago on Sunday, April 22, 2018. 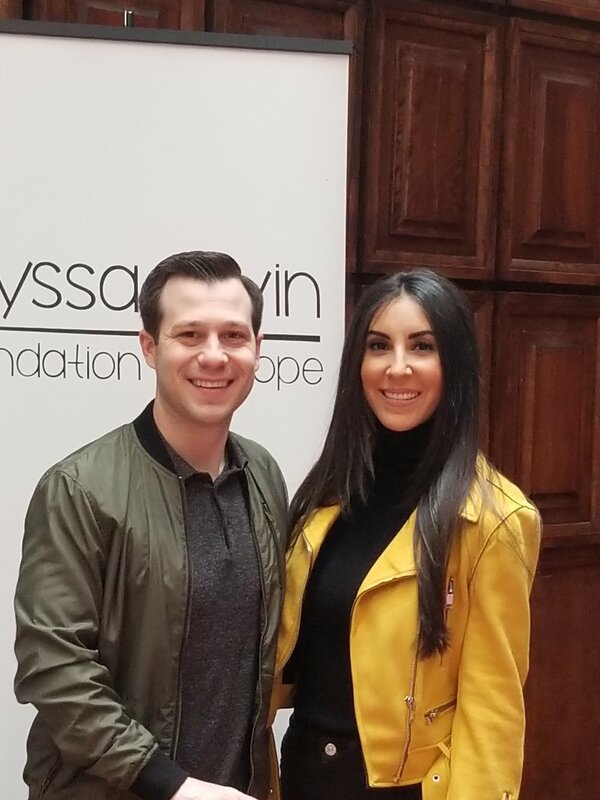 The benefit recital was hosted by Ashlee & Glen Schneider who are both board members of Alyssa Alvin Foundation for Hope. Ashlee was Alyssa’s piano teacher for ten years beginning when Alyssa turned 4. This year’s music recital featured some of Ashlee’s private students, other music students from Matea Valley High School and the Schneider Singers – Corrine, Caleb, Calvin, Clara, Jack, Graham and Nora Schneider. The musicians played a variety of music from classical artists such as Mozart and Beethoven to more contemporary selections. The Schneider Singers sang several songs: Early One Morning, Come with Me, Peanut Song, You’ll Always be a Friend of Me, and the Hello Song. The Schneider Singers are directed by Judi Schneider who is the children’s grandmother and a pianist. They were also accompanied on one song by their grandfather who is a professional percussionist. We also listened to a flute duet by Amy, Ashlee’s sister-in-law, and Ashlee Schneider. There were 2 gift recipients who received gifts – Aldrick, 21-year-old, received a professional art package and Quinn, 12-year-old, received a new drum set! These gifts were made possible because of YOU, our donors and sponsors and we thank you. Special Thanks to Ashlee and Glen Schneider for hosting the 4th Annual Kind Heart Music Recital, all the young musicians and the volunteers who helped with this event. We thank The Fresh Market, Tom Stading from Instrument Exchange and Dra. Martha Juarez for their generous donations to help us raise funds to fulfill our mission. Our goal is to inspire teens and young adults to be creative and give them hope to continue living life to its fullest while facing significant health challenges. 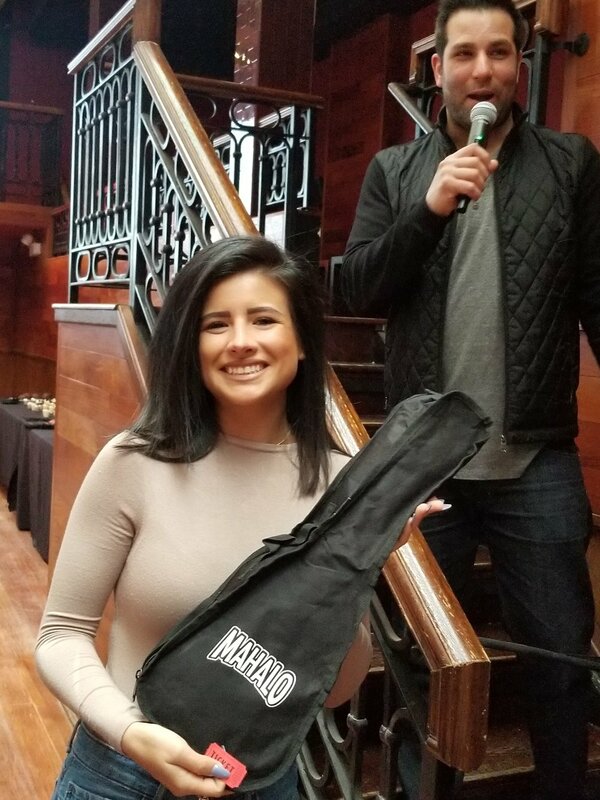 On Thursday, April 12th, Vince Alvin, a board member of the Alyssa Alvin Foundation for Hope (AAFH) and Alyssa’s brother, delivered a set of Bose SoundLink II headphones to a young gift recipient by the name of Bella at her home in Carmel, IN. We first met Bella, her parents and brother at the Ronald McDonald House in Winfield, IL when she was receiving treatment at the Chicago Proton Center. Bella was diagnosed with a brain tumor and has gone through numerous medical procedures during the last couple of years. With all that, Bella and her family have still been in regular contact with the various activities and events of AAFH. Bella’s Mom, Tasha, checks in with us regularly and we heard that Bella would be interested in a set of Bose headphones. We were delighted to get them for Bella just in time for her 18th birthday. It is a pleasure to see her smile with a sparkle in her eyes as she listens to her music while wearing the headphones AAFH has given her. It is great to also know that Bella continues to be strong in her fight to live her life with hope and joy despite the medical circumstances. Bella is surrounded by her loving parents and brother who provide her with all their emotional support to get through her ongoing treatments. Bella is a very bright and strong young adult. It is our wish and prayer that Bella fully recovers from her illness and we send love and support from all of us here in the extended AAFH family! Last year the Alyssa Alvin Foundation for Hope (AAFH) honored Fernando Ponce and Elijah Rivers. They were courageous in battling their cancer while being treated at Lurie Children’s Hospital in Chicago.IL. We are thankful that we were able to touch each of these lives if even for a brief moment to give them joy while they were with us. Elijah Rivers submitted a request for a keyboard despite the cancer in his hands. Elijah was a joyful 18-year-old who pursued many interests besides music. We were able to meet his mom and sisters when we delivered the keyboard to him prior to one of his outpatient visits to Lurie Children’s Hospital. Last January 2017, Fernando Ponce, requested yarn to weave his first ever blanket. Fernando was very happy to receive his yarn and other materials to weave his blanket while at Lurie Children’s Hospital. We met Fernando's grandma who was with him at Lurie's when we delivered his yarn and she was excited for him. She had weaved a yarn purse and gave it to Yoli as a token of her appreciation for what we did for Fernando. Our hearts remember these special gift recipients and we pray for strength for these families. Despite our sadness, our resolve is stronger than ever to reach as many young adults as possible through the Alyssa Alvin Foundation for Hope to give them hope and joy. Tara Medeiros who is a graphic designer and social media coordinator at C2F, Inc. recently contacted Yoli-President of Alyssa Alvin Foundation for Hope. C2F is a premier wholesale distributor, manufacturer and importer of fine art, graphics, craft, office and school supplies. Tara had heard about our foundation and was impressed with how our mission aligned with the company’s own. Specifically, they were impressed with AAFH’s donations of journal kits to young patients with cancer and other life threatening illnesses. Tara visited our website and saw the work AAFH has done with young patients and was impressed enough to make a donation of 4 dozen travel journals in a variety of colors and we are grateful for this very generous donation. On behalf of AAFH, thank you C2F! Dra. 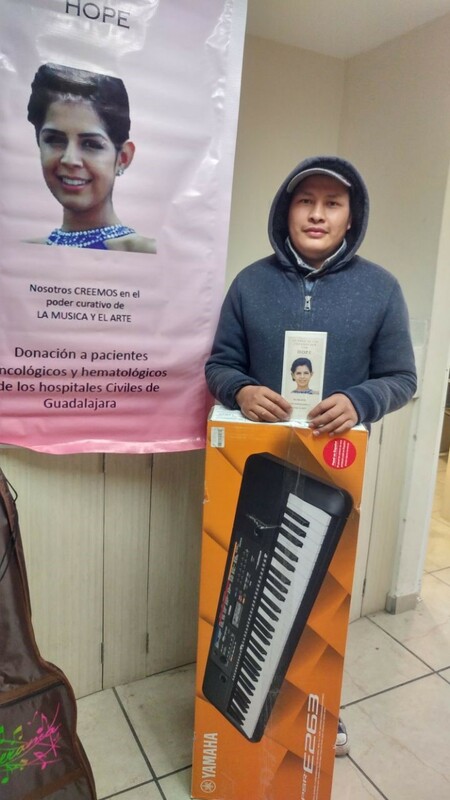 Martha Juarez distributed musical instruments donated by the Alyssa Alvin Foundation for Hope to 4 patients at Hospital Civil (Viejo) de Guadalajara, Mexico on Wednesday, January 31, 2018. Luis Alfonso, 20 years of age, received his guitar. Alejandra, 20 years of age, received her guitar. We want to thank our dedicated volunteers Dra. Martha-Medical Staff from Hospital Civil (Viejo) and her husband, Hugo, for coordinating the delivery of instruments and Alyssa Starter Art kits for this hospital. Diego a 10-year-old, was almost done receiving his chemo at Lurie Children’s Hospital on Friday, February 2, 2018 when he received a surprise from the Alyssa Alvin Foundation for Hope. 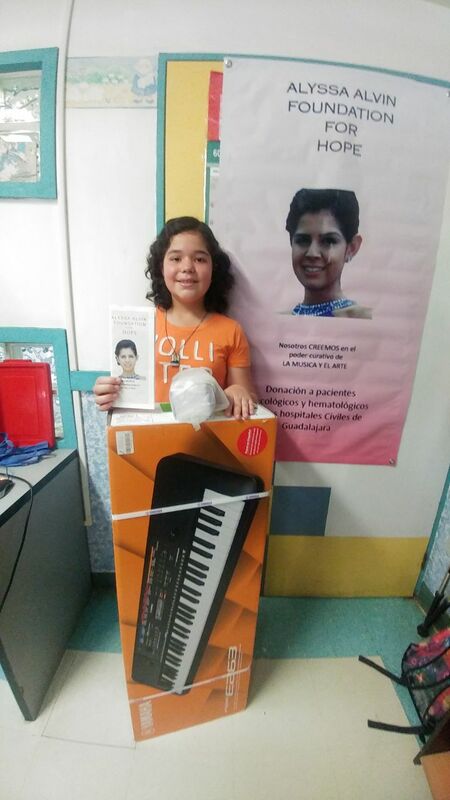 Yoli – Alyssa’s mom and President of AAFH entered his room on the 18th floor to present him with his new electronic keyboard. Several nurses that knew and had taken care of Alyssa when she was hospitalized at Lurie were there and had a chance to say hello to Yoli and share memories of Alyssa. It was a special day! Diego and his mom, Julie, were very excited to see the new keyboard and headphones that came along with the keyboard. He had a big smile when he unpacked the keyboard and the headphones. Diego could not wait to get home to set up and start playing the keyboard. Diego lives with his family in Bolingbrook, IL. He has two older brothers. This January 2018, Diego was diagnosed with liver and bone cancer. Diego enjoys going to the pool, amusement parks and the zoo. He likes to go to the movie theaters with his family. Diego is in 5th grade and he plays the drums in elementary school. He has always shown an interest in learning how to play the keyboard and now he will be able to do it! The Alyssa Alvin Foundation for Hope was created to give hope and provide outlets for creative expression through art and music for young patients dealing with cancer and other life-threatening illnesses. As you can see, Alyssa’s inspiration continues to bring our gift recipients a bit of joy in Alyssa’s memory.